There is an old Lebanese saying which goes a bit like this: ‘Glory to rice while burghol kicked the bucket’. Before rice became staple in the Lebanese kitchen, burghol, or crushed wheat - also referred to as bulgar wheat - was commonly used and added to pulses, vegetables and meats. Rice was the privilege of the rich while burghol remained essentially paupers’ foodstuff. It comes either finely or coarsely milled. The latter requires cooking whereas fine burghol only needs soaking. Today, I cooked burghol filled courgettes or zucchini in a fresh tomato sauce. A yummy dish inspired from the traditional Lebanese dish: Koussa mehshi ateh. Whereas the traditional version is stuffed with rice and cooked in its own juices, this alternative is to cook it separately and serve it in a concassée of fresh tomatoes with herbs and pomegranate molasses. I know that some may think that coring courgettes is painstakingly laborious. True! But…only if you use the delicate white courgettes; if however, you replace them with the large round courgettes - which by the way are just as delicious - coring becomes a doddle. With their flat base they also stand perfectly in the cooking pan. On a warm and sunny day, try this quick and easy recipe of Koussa Meshi bi Burghol wa banadoura! 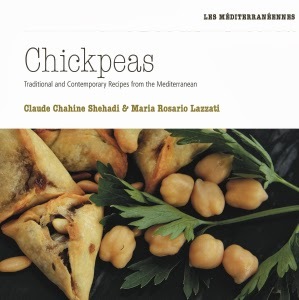 Soak the chickpeas in cold water for 30 minutes before cooking. Slice off the tops of the courgettes. Using a teaspoon, gently scoop out the flesh of each of the courgettes until hollow. 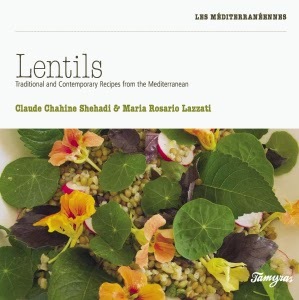 In a bowl, mix burghol, split chickpeas, shallots, and parsley. Dress with lemon juice, sumac, olive oil, salt and pepper. 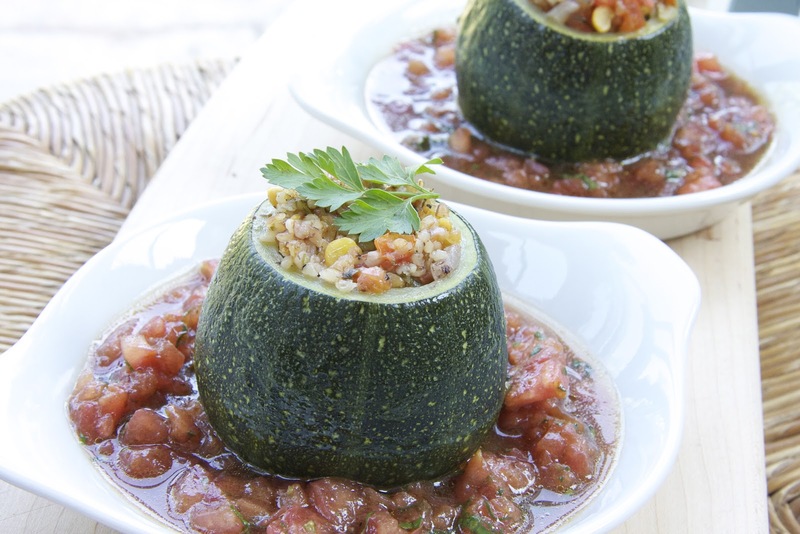 Fill the courgettes with burghol mixture. Make sure not to pack them tightly as the grains need space to expand during cooking. Place the stuffed courgettes in a small saucepan and half cover with vegetable stock. Bring to a boil on high heat, reduce to a simmer and leave to cook covered for about 20 minutes. In the meantime prepare your fresh tomato base. With a sharp knife, make a shallow criss cross incision on the base of each of the tomatoes before placing them in a bowl; cover with boiling water from the kettle. Leave for about one minute. Discard the hot water and replace with very cold water to stop the tomatoes from cooking with heat. Peal the tomatoes, quarter them and remove the fleshy seeded part. Chop them finely and transfer to a mixing bowl. Add the chopped herbs, pomegranate molasses, salt, pepper and olive oil. Taste and adjust the seasoning. Transfer to semi-shallow serving dish. Lift the cougettes off the pan with a slotted spoon making sure to drain as much liquid as possible; place them onto the tomato base. Allow to cool down to room temperature before eating.